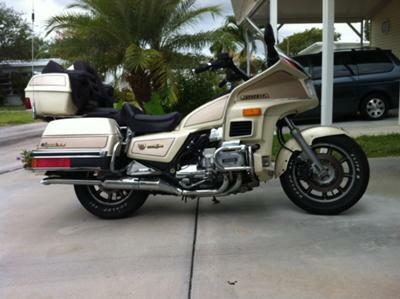 The full-dress, 1986 Honda Goldwing Aspencade SEI for sale is one beautiful touring motorcycle that has less than 20,000 original miles and is in pristine condition. The Aspencade has electronic fuel injection, auto leveling rear suspension, driver and passenger intercom system, cruise control, a Panasonic stereo with Dolby noise reduction, rear seat stereo speakers, on-board air compressor, an improved seat, an exclusive,white and beige two-tone paint color scheme (exclusive to the SE), additional marker and cornering lights PLUS a more sophisticated instrument panel and trip computer. The bike also has a 500 watt alternator allowing the use of additional electronics. Go here to see more and then help me get this motorcycle that has been sitting for 4 years (and has ALWAYS been garaged) out of my garage! The Goldwing for sale is located in Stowe VT Vermont and if you are interested or have questions you are welcome to contact me using the number I have posted below. In my opinion there is not a nicer 1986 Goldwing for sale in Vermont, on Craigslist or on Ebay for my low price of only $3999! GoGoCycles would also encourage bikers to submit a review of the 1986 Honda Goldwing Aspencade SEI to make the biker community aware of any problems that are commonly associated with the fuel injected model or to highlight its positive features and help potential buyers make informed decisions. If you're interested or have questions you are welcome to contact me and don't forget to mention that you found this ad on GoGoCycles Used Motorcycles for Sale in your message. 1) How many mile on the unit? 2) How long have you had it / mileage you have put on it? 4) Condition 1 to 10? 6) Is the chrome in good shape or rusty? 7) Is the dash all milky from setting out in the sun? 8) Does every thing work on the bike? I would like to know more about your SEi. I had one and lost it in a divorce and I said I will have another one before I died. So, I would like to know anything you can tell me about it. I sold mine here in Nashville ,Tennessee,so she wouldn't get it and still have the key to it. I'm a retired firefighter, am now single and want to travel since there is nothing to hold me back. It would be funny if the one you have for sale is the one I lost. You can reach me at email luis2b46@yahoo.com or call me at home at 615-837-5736 or on my cell at 618-686-7358. I hope to hear from you soon. Your biker friend Luis Nashville, Tennessee.